Brand new to the market, this quiet studio with western exposure, features 2 closets, beautiful oak floors, beamed ceilings and pre-war detail throughout. The main room is 18'x12' with a generous foyer that leads to a separate kitchen and bath. 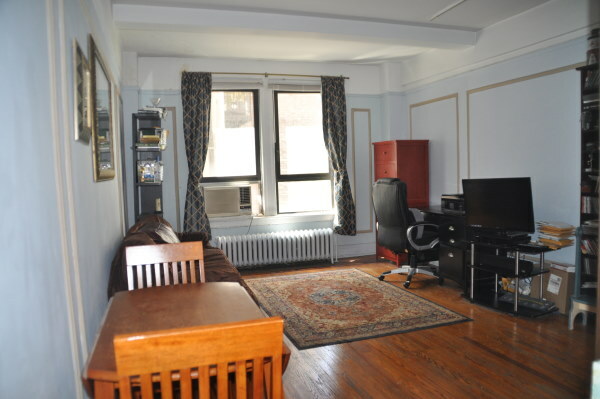 The building is a gem in the midst of the most exciting area on the Upper West Side. It is steps away from the world of gourmet eating where one never has to cook again. Appropriately, the entrance into the building is through a charming lobby that has the marble floors and plaster detailed ceiling. It is a fitting entrance into the world of the Broadmoor. The Broadmoor is an 18 story prewar building with a 24 hour concierge and doormen. The live-in superintendent has a staff of porters and maintenance people. There are bike rooms on each floor and a well-kept laundry room in the basement. There is a large glass enclosed solarium and an outdoor deck at the top of the building, which the Broadmoor community uses as a place to view gorgeous sunsets, get some sun and use wireless internet access The sale of this apartment is subject to Board approval. The Board allows purchasers to finance up to 80% of the purchase price.